Whilst on the phone at work the other day, I found myself doodling a little festive pen sketch. It was one of those things that I did without even thinking and it wasn't until later that I noticed it on my page at all as I scribbled down another phone number. I chuckled to myself and thought that it might make a rather cute and amusing Christmas Card! Over the last few weeks I have been really busy, not only with Christmas preparations but also with preparations for my next oil painting, so unlike last year when I posted the Baubles and a Cocktail glass as my Christmas post, I haven't had time to produce any thing like it this year! So, I decided to recreate my little doodle, a little bigger, with a little colour but minus the coffee ring and scribbled telephone numbers beneath! I thought that it would be the perfect Christmas card to all of you, my lovely bloggy friends! It's been an interesting year for me. I made the decision to leave my course and it is only since I left that I finally realised how 'Sandra' paints. Now I can honestly say I have realised my own style at last and it feels like 'me'! That in itself is one of my biggest achievements of the year and I now find myself with the backing of a Gallery too. Whether it progresses or not, I can not think of a more positive way to end the year than that! I want to say a HUGE thank you to all of my followers, old and new, for your continued support and endless words of encouragement throughout the year. I have met such wonderful people! Speaking of which, I was asked today by one of my American bloggy friends, what I mean when I speak of 'Boxing day'. I was really surprised since I ignorantly assumed that everyone has a Boxing day! So, for the benefit of those from across the pond, Boxing Day is quite simply the day after Christmas Day. But it has become like a second Christmas Day and it has it's own traditions that come with it. Sprouts - I am one of those who LOVES sprouts! Next, we will indulge in a traditional Christmas Pudding (my FAVOURITE!!! ), which we will first steep in Brandy and then set fire to it at the table. Once the flames have gone out, we will cover it in fresh double cream (some prefer Brandy butter - I love both!) and devour it! We usually have an alternative pudding too for those, like my Sister, who dares not to like Christmas pudding! This is all usually washed down with a merry glass or two of wine along with some terrible jokes from the crackers, which we pull at the table!! Then on Boxing day we are having Paul's Mum over, followed by his Sister and her family later on in the afternoon. We don't have another Christmas dinner on Boxing day but we will still eat lots of yummy things from the left overs of Christmas Day. Some people make a turkey curry and that has become the traditional thing to do over here. But - we tend to have cold meats, smoked salmon, a cheeseboard, some salads etc. And of course there will be mince-pies with cream too! And Christmas simply wouldn't be Christmas without a bottle of Original Baileys Irish Cream and a tin of Quality Street or Roses chocolates... Mmmmmmmmmmmmm.. The day after boxing day is all about staring at our huge reflections in horror and trying to squeeze our newly gigantic bottoms in to our jeans having over indulged in a big way for the several days beforehand!!! What will you all be up to I wonder? So, this is my final post until the New Year and I am sorry in advance if I miss any of your own posts during this festive time! Merry Christmas to you all and have a very happy, 'arty' New Year!!!! 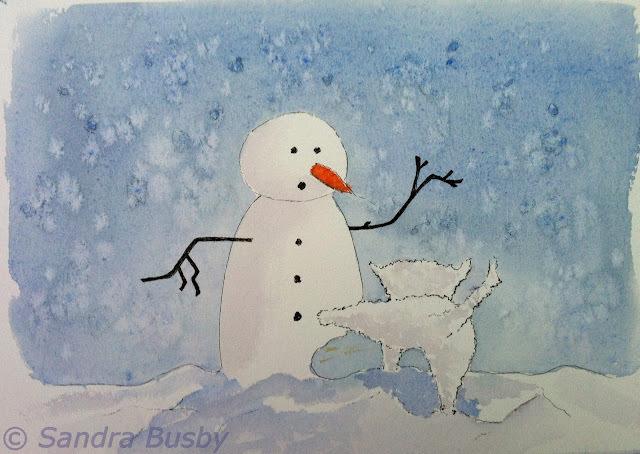 Hi Sandra, your snowman is really delightful and....the little dog even more! I wish you and your families a Merry Christmas and a Happy New Year!!! Hugs. Tito. Your celebration sounds like SO much fun. Wish that one day I could come and give you a visit during this festive time, and then you could show this yankee a thing or two about chipolatas (which I had never even heard of until I read Harry Potter) and Christmas pudding. Happy Holidays!! I will be eating fudge and toffee and ham sandwhiches hand over fist! Hello Sandra. William here. Hahahahaha. Why is the dog weeing on the snowman? What a lovely Christmas card! :) We will be eating too much here too! I wish you and your family a Merry Christmas and a fabulous New Year! Thank you for the wishes. I too wish you a really really great Christmas and 2012. I loved going through the post. It is so good to know about what you'll be doing and it was better to know about that dinner menu. I wish I could join you. ha ha ha - love the painting! Oh my I love this!! It could be one of my wee dogs (well, the boy one anyway!) this is hilarious! I'm so pleased to have found you in the blogosphere and am delighted that things are progressing as well as they should be for someone as talented as you are. I plan to make a huge effort next year to get enough work together to approach local galleries and success won't just land on my lap! I did shut my eyes at that list (apart from all the gorgeous vegetable part - I also love sprouts!) I did used to love a full trimmings Xmas dinner but this year will be having the works but in a totally fake meat style - my local health food shop does a vegan stuffed turkey joint with pigs in blankets - yay!! Nice to see you end your blogging year with a bit of fun Sandra. It would be interesting if you had just added the watercolour to your scribbling, coffee stains, telephone numbers 'et all' just to see how it came across! I was informed many years ago, that Boxing Day was when servants were given Christmas Boxes from their employers in times gone by. What a beautiful Christmas card this would make! Love this snowman!! As far as the dinner...you never told us the time you want us over!!! Happy Holidays...see you 2012! LOL ... I love the card!!! To elaborate a little on what Frank has said about the origin of Boxing Day, in times gone by the lords of the manors used to reward their staff by giving them the day after Xmas off work to visit their own family's. It was to thank them for ensuring that Xmas day ran smoothly for the family of the house. The servants were presented with small boxes of left over food to share with their loved ones. wishing you and your family a very happy christmas sandra !